An emergency vehicle drives through a neighborhood in Rowlett, Texas, Sunday, Dec. 27, 2015, the morning after it was struck by a tornado. At least 11 people died and dozens were injured in apparently strong tornadoes that swept through the Dallas area and caused substantial damage this weekend. Fort Worth-based American Airlines has stepped up to help victims of the deadly tornadoes that tore through North Texas Saturday. American Airlines pledged an immediate $100,000 to the local chapter of the American Red Cross to help tornado victims after an EF4 tornado caused severe damage in Garland an a slightly weaker tornado hit Rowlett. 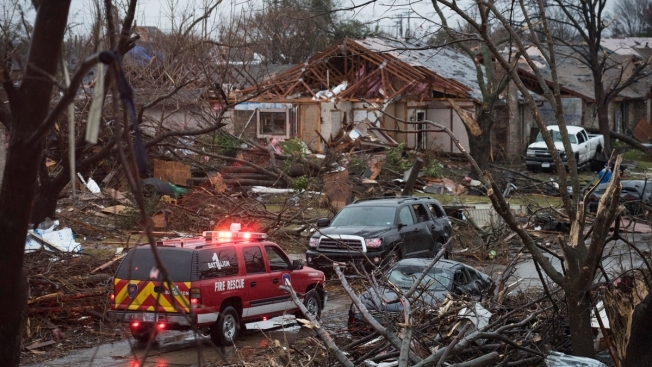 The severe storms that caused the tornadoes killed 11 people Saturday afternoon. American said customers who make donations via AA.com/RedCross "will be awarded AAdvantage miles for their generosity." "The tornadoes that hit North Texas during the holiday weekend caused significant damage and impacted thousands of lives," said Joe Taney, American’s vice president – DFW Hub Operations, via email. "American and its employees stand ready to assist in the recovery efforts and we encourage our customers to join us by donating to the Red Cross." Taney also thanked American Airlines' 25,000 employees in the Dallas-Fort Worth area who worked through the holidays and severe weather.